Wow...there's quite a few projects in the works. The back right pony is the base for Eferia. New sketches uploaded at the custom workshop. The front left pony is Chasing Halos. She received a new set of custom knit legwarmers. Instructions are here for brave knitters who want to venture into the world of miniature knitting. The front center pony is Thorns. Her symbol is about 50% complete. I got her hair in the mail...she will be re-rooted next. 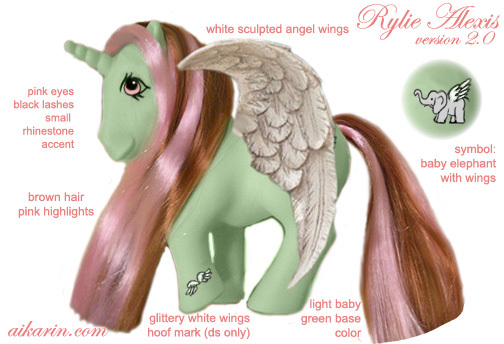 She is an alicorn with sculpted wings. Yes, my first foray into that area...LOL, I wasn't planning to, but the designer of this pony insisted! ^_^ The wings are actually based on a garden sculpture in the form of an angel. AIKARIN THE DESIGN LOOKS GREAT! I CAN'T WAIT TO SEE HER FINISHED!!! THANK YOU SO MUCH FOR WORKING WITH ME! ALSO THORNS LOOKS AWESOME LOVE THE DESIGN SO FAR. I found that one of your messages got caught in the SPAM filter...I sent you a note about it today. Please remember to include the word "pony" in the subject heading to bypass the filters. Thanks! ^_^ Someone placed Sapphire Snow on sale until the end of the year. You might have a chance at her in January. Hope the Christmas shopping goes well! Pony Legwarmers = LOVE!! Can't wait to see the finished one. Thanks for the comment! ^_^ Legwarmers are soooo 80's, but really cute on ponies.